I have yet to step into the DFP! I intend to sometime in the future. I hope they don't scrap this place...worth maintaining it and they should train up local musicians to fill up the orchestra. I once visited a church in a foreign country where they say it has the best acoustics in the world...and that was constructed many centuries ago compared to modern ones we have here. I never tried out my vocals there though. RM130,000 paid to the conductor? I can't commend on that. GM's CEO earned US$15mil last year, even though the car maker lost money. spent RM3.5 million a month?? Wonder how much Petronas can earn per month..
Wah RM130K paid to be a conductor? Gee, I'm in the wrong line la ... LOL! 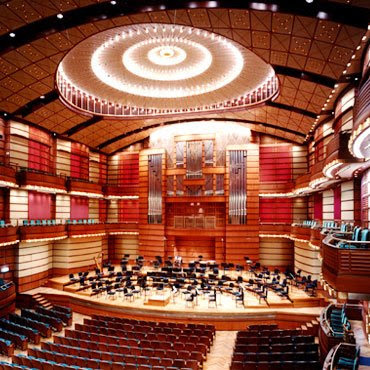 Honestly I think the MPO is a very good set up to nurture the Malaysians on appreciating the orchestra and music. Being a Malaysian, I'm embarrassed that I actually haven't been there before. So far I'm only interested in musicals and I'm going to see Mamma Mia! my bug life, oh it's time you visit it! Too bad they don't allow any kind of photography inside the hall, otherwise you can come back with some really good photos of the place! victor, obviously Petronas earns much, much more than that every month. Will we ever know? I thought it was revealed once before? nick phillips, haha! So you want to be a conductor? If no musical training, only can qualify as bus conductor. LOL! eiling, you must go to DFP at least once! Yes, it's actually a very good set-up to nurture young Malaysians to become world class musicians. If the Govt scrap it, we will lose that opportunity. It will also be a great loss to Malaysia as the DFP and MPO are symbols of KL as a world-class city. Who said playing music doesn't pay eh? i never been to this place before but i heard about it on radio, about the concert etc. i just hope that i can go there someday. you going? I almost bought the ticket to watch Mamma Mia but changed my mind..too pricey. The church I visited was in Israel couple of years back. faisal admar, oh I like Vivaldi too! Do you mean Baroque? Yes, Baroque music is nice, very calming. Well, you should go one of these days. I would have gone to watch LOTR symphony this weekend - too bad tickets all sold out! my bug life, yes the ticket is too pricey. That kind of price I can use to watch a few concerts in DFP! Haha! Oh, so the church is in Israel. I thought we cannot go Israel? I love classical music and hubby and I used to go and watch the San Francisco Philharmonic Orchestra. That was before marriage and kids! :o) That's good if Petronas is supporting the training of young musicians, then hopefully your philharmonic orchestra will be composed of Malaysians in the future. Arts and music is usually the last on the list to give money to by the government so I'm glad when I hear rich people give money to these causes. Nevertheless, it is sooo spectacular! :-) I enjoyed dropping in to read your post. I've no real reason to go there cos I'm not much of an enthusiast of classical music. The dress code doesn't help too. But if they didn't enforce all those rules, then it wouldn't be such a classy joint already. i didn't know they have strict guidelines they expect you to adhere to. what a nice hall! but I haven't been there before..
Foong, it's allowed only for the purpose of pilgrimage. Well, sometimes it's life a chance of a lifetime. I rather pay RM300 here rather than fly all the way to the other side to catch the musical. I think we need music. It's not the necessaries of our life, But what a life can be without it? I think Malaysia government do a good deed to introduce world-class music to the people. And I notice that the ticket price are much much cheap than we can buy here! That's a good deed to the whole nation. I hope I can have chance to visit it. I actually like to attend all these musucal show and theatrical plays, but we have none of these in my small town. I will definitely go if I live in KL! wow! i think we all should go become a conductor instead. cis. p/s: i thought those concert goers in europian countries are usually all dressed up in formal suits? Wow! That's a whopping amount to spend! =/ I have never been there before. Shame! Shame! my bug life, oic! That's new to me! iwalk, yes I can't imagine life without music! Life will be meaningless! It's good the Malaysian Government recognises the need to introduce classical music to the people. Only thing is, I hope they will continue to do so with the economy going down! levian, yes corruption is eating it all up, so sad! tekkaus, it's a big amount all right. But it's for a good cause. You should go there at least once! Small money only, Petronas making so much money everyday. man, how man yppl it would have helped! especially during de recession! carrot, it may help during the recession, but are we willing to sacrifice art and music for that? All depends on our needs and priorities. mariuca, I know that only too well! Malaysians generally follow Malaysian time ie. half an hour later than stated time. But you'll be surprised to know that Malaysians also make the effort to be punctual when they attend concerts at DFP cos they don't want to lose their money! Haha! I remember going there once because I had a free ticket. Let's just say classical music isn't exactly my cup of tea. They made me change into 1 of those batik shirts they provide & I almost fell asleep a few times. How embarrassing. But the hall itself is magnificent, although it look a lot bigger in the picture than in real life.